Once again this year, the Smithsonian Latino Virtual Museum has created a Día de los Muertos 3D experience in partnership with the University of Texas at El Paso. This fantastic website has some great resources including lesson plans, videos, a kid's interactive (shown below), and a dancing calavera interactive (totally hilarious!). 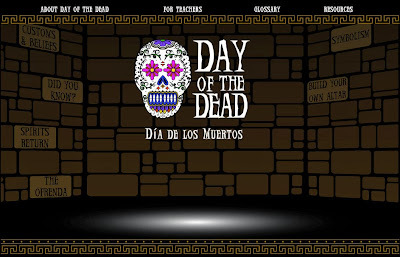 You can also follow their official Day of the Dead/Dia de los Muertos blog on Tumblr. 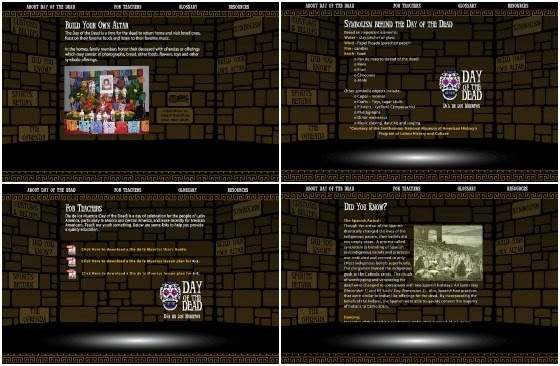 The kid's interactive site gives a good description of the holiday with information explaining the ofrenda, the symbolism, and more. You'll also find several downloads including a fact sheet, user's guide, more lesson plans, and reading lists. There's even a glossary included for those not fluent in Spanish. This is a good website for teachers and parents looking to supplement their Día de los Muertos studies.